On January 17, 1920, the 18th Amendment to the U.S. Constitution went into effect. “The manufacture, sale or transportation of intoxicating liquors…” was banned in Arizona in 1915 – 5 years prior to the national moratorium. 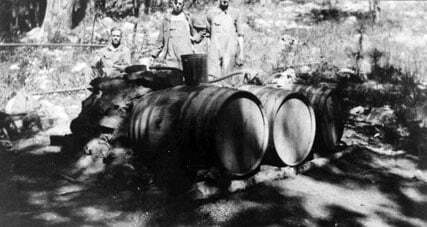 As a result Arizona was the 13th individual state to go “dry” before prohibition became the law of the land and “Payson Dew” moonshine was born. When word of the new law reached the isolated town of Payson the townsfolk were not receptive. The many bars and saloons along Main Street were primary social centers for the ranchers and miners of Rim Country. With the arrival of Prohibition the saloons could remain open for pool and card games, gambling, dancing and fighting. But drinking became an underground activity. The 18th Amendment may have intended to stop alcohol sales and consumption but in Rim Country it was “a blessing in disguise” for the economically depressed area. At the time the annual income for most local people was $500…if they were lucky. Whiskey flowed as the “bootleg” enterprises grew. New stills sprouted in the canyons. In an Arizona Highways article, Vernon Haught said that 30 to 40 stills were operating in the Payson area. Frenchy Choquette (also reported as Frenchy Paquette is some sources) sold illicit whisky from a building known as “The Dive”. Frenchy eventually sold the building to the Women’s Club after he quit the business. Unaware of the change in ownership, Revenue Agents raided the building one afternoon only to find women washing dishes after their luncheon meeting. The reputation of “Payson Dew” spread far beyond Rim Country. The brew was in demand as far away as Los Angeles. Zane Grey movies were being made on location during those days and the Hollywood film crews were quite impressed by the quality and kick of the local concoction. Business may have been flourishing, but it was still illegal. Federal agents (known locally as “Prohis”) made many trips to search out and demolish the stills. Vernon LaMorr (LaMore according to some sources) was an agent with ties to the area from his school years. He would telephone Mae Haught and say he was coming on a fishing trip. The word would then spread of his impending arrival. In Star Valley bells were hung on all the mules. They were then sent scattering throughout the countryside to warn those tending stills that agents were on the way. When Revenue Agents left Globe heading up to Payson, a series of phone calls would be placed that had a special ring. Thus the word spread through the town that they were on the way. Finding the bootleggers and demolishing their operations was difficult due to well-hidden stills, bad roads and the effective warning systems.